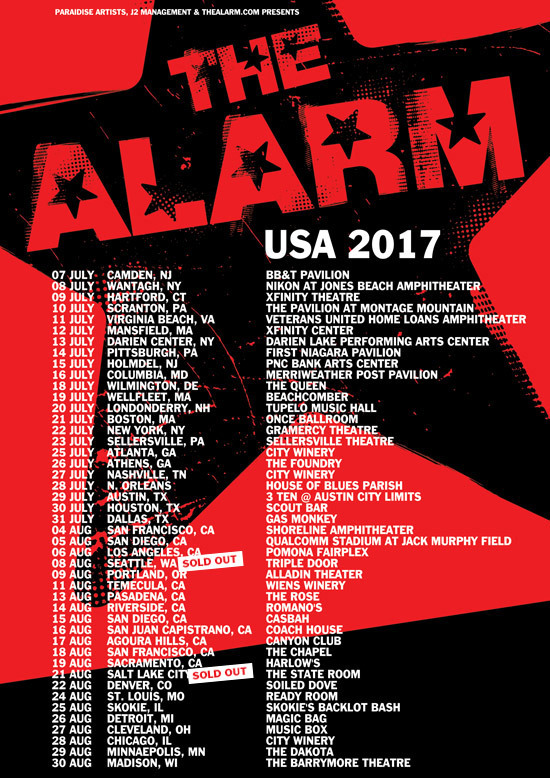 Mike Peters and The Alarm undertake their biggest US tour in years with 45 dates starting this July 7th through August 30th and some of the headline shows have already started to sell out. The concerts at Salt Lake City and Seattle have now both completely SOLD OUT and other shows in New York, Boston, Sellersville, Atlanta, San Francisco and Sacramento and are all getting close to capacity. So please, don’t leave it until the last minute to get your tickets. Coinciding with the official USA release of ‘Man In The Camo Jacket’, the tour will kick things off in spectacular style on July 5th with an official premiere screening at the Williamsburg Theatre, NY. The Alarm will be performing a set with some very special guests during the official post film reception at the Brooklyn Bowl. Other East Coast shows include a July 8th appearance at the the 16,000 Capacity Northwell Health at Jones Beach Amphitheatre, NY (where The Alarm once performed with Bob Dylan back in 1988), the 18,000 capacity XFinity Centre near Boston, MA on July 12th and the 24,000 capacity Darien Center, Buffalo, NY on July 13th. The East Coast run will culminate at the 17,000 capacity Merriweather Post Pavilion near Washington DC on July 16th. On July 17th, there will be another official premiere screeing of ‘Camo Jacket’ in Washington DC and then all manner of headline shows including a return to the Gramercy Theatre, NYC and the Once Ballroom in Boston, MA. The band will then trek across country through the southern states taking in shows at Atalanta, Athens, New Orleans and Nashville before a run of shows throughout Texas. On August 4th, the band will rejoin the Vans Warped tour in San Francisco, California at the 25,000 capacity Shoreline Amphitheatre and then perform on Saturday August 5th at San Diego’s Qualcomm and on Sunday August 6th at the 18,000 Capacity Pomona Fairplex, Los Angeles. The band will then headline shows in the Northwest at Seattle, Porland before descending on California again and then all the way back across to the mid-west with dates in Salt Lake City (Sold Out), Denver, St. Louis, Chicago, Minneapolis and finally in Madison WI. Mike Peters charity Love Hope Strength will be at every date of the tour. Ticket links can be found on the alarm.com front page in the upcoming shows section. US Tour Dates in full here. Dave Sharp to appear as Special Guest on all UK October Tour dates.